where he devoted his energies chiefly to the stndv of rhetoric and metaphysics, reading Sir William Hamilton, Mill, McCosh, and Herbert Spencer. In the summer of 1867 he went to Paris and studied the political institutions of the past and present of Europe, being occasional Paris correspondent to the Chicago "Times." He also attended at the College de France a course of lectures on Montesquieu's " Esprit des Lois," by Edouard Laboulaye. In the meantime, iu order to prepare for a business career in the iron industry with his father, he had carried on special studies in the various metIxxls of manufacture. He went from Paris to Berlin, where he took a course in iron metallurgy, under Dr. Wedding, at the School of Mines. Subsequently he made a tour of inspection through the iron and steel works of Western Germain1, South Wales. England and Scotland, inquiring into the process of making Bessemer steel, which was then beginning to take the place of puddled and rolled iron. In the spring of 1870 he joined his father in business in Cleveland, and in 1874 he became one of the firm of Rhodes & Co., who were both producers and coin- mission merchants in coal, iron ore, and pig iron. Yet in the midst of a successful business career, his old longings after a literary life did not forsake him, and he determined to retire when he should have obtained a competence sufficient to devote himself exclusively to literary work. Reaching this point in 1885, he gave up business. For several years previous to tliis, Mr. Rhodes had been revolving in his mind the project of treating some portion of the history of the United States, and had read largely with that end in view. This now look shape in the selection of 1850-58 as his subjetc. Devoting two years to general reading and European travel as a preparation for his special studies, lie then went to work diligently on his history. 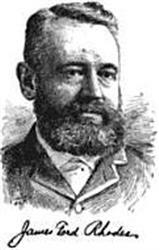 In the autumn of 1891 he removed from Cleveland to Cambridge, and then completed the manuscript of his first two volumes of the " History of the United States from the Compromise of 1850." They carried the narrative to the election of Lincoln in 1860. and were published by Harper & Brothers in November, 1892, the work being brought out in London at the same time by Maemillan. In a month a second American edition was called for, and in 1895 a third was printed. In June, 1895, the third volume,continuing the history to the spring of 1802, was published. The work has been well received by the critics. The " Nation " mentions as its merits: "Abundant and almost exhaustive collation of material, simplicity and directness of method, good judgment in the selection of topics for full treatment or sketchy notice, calmness of temper and absence of passionate partisanship." "Mr. Rhodes," the writer adds, "may fairly be said to be a pupil of the'Gardiuer school, and to have made the great English historian a model iu subordinating the literary element to the judicial.'' Prof. McLaughlin says in the "American Historical Review": "Mr. Rhodes is writing a political and social history with rare judgment, accuracy and patience, with good literary skill, and with sincerity and honesty of purpose." The following are some English references : " One of Mr. Rhodes's chief excellences as a literary artist is bis power of characterization. "—"The Spectator"; " His impartiality is really judicial, and never results from missing or underrating the greatness of the issues wherewith he is dealing. "—" The Saturday Review "; " Mr. Rhodes not only takes great pains, but he has the art of giving pleasiug literary expression to his conclusions. "—"The Athenaeum ' ; " He writes as one under a spell; he is fulfilling an inevitable destiny." — E. J. Payne, in the "Academy." In 1893 Adalbert College of Western Re- servc University conferred on Mr. Rhodes the degree of LL.D., and in the same year he was elected a resident member of the Massachusetts Historical Society. He also belongs to the Military Historical Society of Massachusetts. He now (1897) resides in Boston, and is making the completion of his history the business of his life. He was married, in 1872, to Ann Card of Cleveland. They have one child, a son.